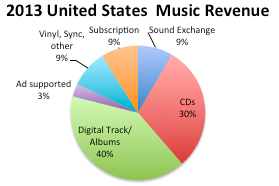 The RIAA recently released US music industry statistics for 2013 and it’s good news for the streaming services. More than six million customers subscribe to a service like Spotify, Rdio, Rhapsody and others. And these companies are providing a massive amount of money for the industry. Those six million created over $600 million in revenue. These are far and away the most valuable music customers, dwarfing the amount of money that each CD purchaser, ad supported (e.g. YouTube) or digital radio user contributes. Based on the number of purchasers from NPDs 2013 Annual Music Report and available estimates of YouTube and Pandora users, subscription users are worth more per user than all the other major categories combined. I’m sure many artists and management firms are saying ‘that’s great, but why am I not seeing the money?’ Two reasons: scale and deals. First, only 6.1 million customers subscribe, which is the smallest reach of any other recorded music product. How does it compare? Well Pandora reports 140 million active users on mobile. YouTube says it has 156 million actives per month, with nearly 40 percent consuming music. NPD estimates that 44 million bought at least a single track in iTunes. Six million pales in comparison. What’s also unclear are the rates by which artists are compensated by streaming services. A vast majority of the streaming deals for master recordings are with major label groups and indies. While many indies have said they split revenues 50/50 with artists, understanding what an artist receives from a major label deal, often executed well before streaming services existed, is a dark art. The industry could do much better by committing to transparent and standardized reporting, where every deduction is laid out and an artist can see how many plays of their repertoire were on Spotify and understand what it means to their pocketbook. But then again, mysterious accounting has been the labels’ modus operandi for many decades. WME’s Marc Geiger mentioned at MIDEM this year that all we have to do is build scale. This is the one flaw in his excellent speech. Instead of expecting everyone will pay $10 a month, the industry needs to consider many more options that focus on different ways fans listen and value music. I have been beating the drum for subscription services to diversify their products. While 6.1 million people paying $10 a month for all you can listen to music products is great, we need to grow the number of people who pay for a music subscription. The truth we must accept is that the average person does not–and will not–spend $10 per month for infinite music. They just won’t. There are too many free options and most people are happy with a much smaller slice of the music universe. Instead, we need to redefine how we package and market digital music. What’s the music app that 30 million people will pay $1 a month? How about a $3 and $5 price point? To grow the number of people who will pay for services, diversification of product offering must take place, even if the revenue per user drops closer to retail levels. Success is getting 50 million customers paying a range of prices that fit tastes and budgets. Not selling a one-size-fits-all product. A note on the numbers: while the RIAA numbers for the revenues as well as the streaming subscriber count are accurate , I had to guesstimate on the other user counts. By cobbling together estimated revenue that each company contributes and comparing it to the active customers of each, I came up with a rough number, but without reliable information and transparent accounting, it’s just that–rough. The problem you illustrate very well here is both true and unsurprising. The DMCA itself and the ludicrous limitations of the “Performance Compliment” were designed specifically to reduce choice, slow down the transition to digital services, maintain the high profit margins of the CD (i.e. discourage “replacement”), and retain as much control of the recorded music marketplace as possible when the smoke cleared. Endless and expensive negotiations about every little detail of interactive music applications is just another day throwing sand in the gears of progress for the big labels. The web is an interactive medium at its core. The fact that interactive subscription services have been licensed at all is the remarkable thing. And let’s not forget that these licenses are obtained for a big chunk of equity in the digital service and typically lubricated with tens of millions of dollars of VC cash. It’s a steep tax on innovation and an attempt at remote control of the outcome. All in all, it’s a classic business school case study in how not to operate an entrenched industry when faced with disruptive change. The_only_thing that’s moved the needle in the last 15 years has been massive action by consumers embracing or rejecting digital formats and services and their related business models. Apple helped to rationalize downloading and make it just easy enough for average users with iTunes, and now the suite of iCloud music services to support mobiles. Streaming simplifies the user’s responsibilities to the point that it’s pretty much guaranteed to become the mainstream service model and Apple will probably adopt it soon. But I no longer expect the recorded music industry to act in a timely or even rational manner in allowing it. As a friend of mine said recently about the public radio business “They seem to value control over increasing revenue and service to the public.” It’s the definition of short-sighted — in that case, not so much for money as control. So, greed or dominance? Choose your sin. it’s rarely about what’s good for users until they have no choice.